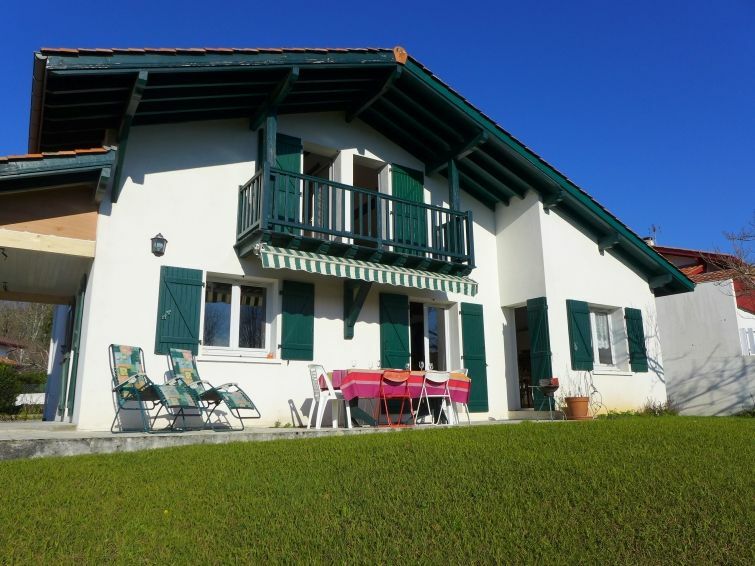 Saint Pée sur Nivelle 13 km from Saint Jean de luz: Single-family house "this property". In a quiet position, 13 km from the sea, 13 km from the beach. Private: well-kept garden (fenced) with lawn, natural garden, parking on the premises. Grocery 1 km, restaurant 1 km, bar 1 km, bakery 1 km, café 1 km, 7 minute walk to the centre, railway station "Saint jean de Luz" 13 km, lake Saint Pée 2 km. Nearby attractions: Fronton 1 km. Hiking paths: La Rhune. 4-room house 118 m2 on 2 levels. Object suitable for 4 adults + 3 children. Comfortable and beautiful furnishings: large living/dining room with veranda with TV (flat screen). Exit to the terrace, south facing position. 1 room with 1 french bed (140 cm). Kitchen (4 hot plates, oven, dishwasher, microwave, freezer, electric coffee machine). Exit to the terrace. Bathroom, sep. WC. Upper floor: 1 room with 1 french bed (140 cm). Exit to the balcony. 1 room with 2 beds (90 cm). Alcove with 1 bed (90 cm), TV (flat screen). Exit to the balcony. Shower, sep. WC. Electric heating. Large terrace, south facing position. Terrace furniture, barbecue, deck chairs (2). Very beautiful view of the mountains. Facilities: washing machine, iron, hair dryer. Internet (WiFi, free). Please note: 1 small pet/ dog allowed. Smoke alarm.